Hours: 9 a.m.-7 p.m., daily. 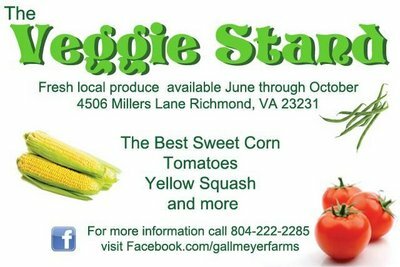 Between mid-June and October 31, The Veggie Stand in Richmond, Virginia, offers a bounty of fresh-picked, homegrown, summer produce. Our Gallmeyer Farms Famous Sweet Corn is a highlight of our summer season. We also specialize in heirloom tomatoes, Hanover Tomatoes, squash, beans, okra, melons, Virginia Butter Beans, and more. Our Gallmeyer Farms unpasteurized, local honey is also available daily at The Veggie Stand. We also support local farm families from Richmond and surrounding areas who provide us with specialty crops like homegrown lettuce, spinach, kale, and seasonal berries. We also have free range chicken eggs.